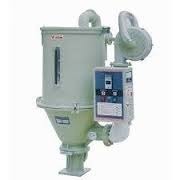 Our range of products include hopper dryer. Hopper Dryer offered comes backed by latest technology support and features PID temperature controlling system adopted as well as display support for regeneration and real temperature. Other than this, these dryers also come with option of adjusting speed of honey comb with different dew point configurations. Some of its features include PLC control and LCD touch screen support; provision of dew point meter for effectively supervision of dehumidifying effect; compact designed finish; comes with industry certification.